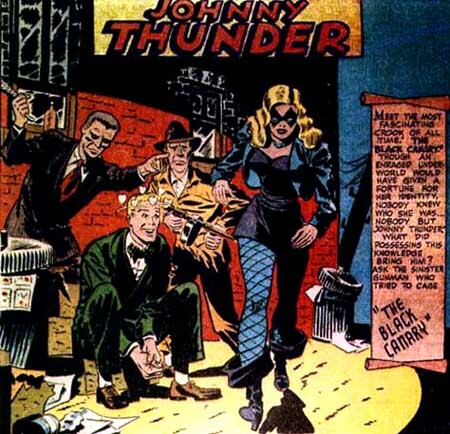 This timeline does not attempt to include all appearances ever made by the Black Canary, but it does attempt to give an overview of her involvement in the DCU since her creation and to especially note the changes her character has undergone over the years. Please see Collecting Dinah for a listing of her comic appearances. All-Star Comics #41 — Black Canary joins the Justice Society of America after helping crack the "Case of the Patriotic Crimes"
September/October 1969, Justice League of America #74 — conclusion of the JSA/JLA crossover which results in the death of Black Canary's husband Larry Lance and her decision to leave Earth2 for Earth1. November 1971, Green Lantern/Green Arrow #86 — Black Canary helps Roy "Speedy" Harper through his cold-turkey withdrawal from heroin in one of the most famous story arcs in comic book history. October & November 1983, Justice League of America #219-20 — the "true origin" of the Bronze Age Black Canary is revealed during a JLA/JSA crossover, where she discovers that her entire history since leaving Earth2 in JLA#74 was based on a well-meant lie. She is not Dinah Drake Lance, the original Black Canary and widow of Larry Lance; she is Dinah Drake and Larry Lance's daughter. This revelation retcons everything back to JLA#75 and explains her little-used "canary cry" to be the result of the supervillain Wizard's curse. There are bizarre overtones to this origin story which don't bear too much questioning. September 1985, Detective Comics #554 — Black Canary II asserts her independence from her mother's legacy and dons a new (and hideous) costume (the first in an unfortunate string of bad costume choices which finally came to an end with her Oracle-guided makeover in the first Birds of Prey one-shot). She also graces the cover of this issue in an homage to the first Black Canary's first cover appearance almost forty years before. 1985, Justice League of America Annual #3 — Black Canary, Green Arrow and most of the A-list ex-JLA members join the current group in this Crisis on Infinite Earths crossover story. (Canary survives the Crisis and eventually ends up with a nicely reworked origin and backstory as a result though she continues to wear the frightening costume for a few more years — none of that takes place in this story, however). February 1986, Detective Comics #559 — In a very pre-Crisis-ish post-Crisis tale, Black Canary and Green Arrow team up with Batman and Catwoman to right an injustice. All of this pre-dates the retconning of Batman: Year One & Year Two which will make this story an Elseworlds tale very soon. March 1987-November 1988, Legends miniseries & Justice League (International) #1-#19 — Black Canary enters the Post-Crisis universe with a bang, helping refound the Justice League along with Batman and Martian Manhunter. It is ironic that the issue where she resigns from the League comes out in the same month as the Secret Origins issue which retells the original founding of the Justice League of America with Black Canary taking over the role which Wonder Woman, in post-Crisis continuity, could no longer have played. 1987, Green Arrow: The Longbow Hunters — Mike Grell redefines the Green Arrow and the Black Canary for the 1980's. It is in this minseries that Dinah is tortured and, as a result, loses her sonic or "canary" cry which had been used only sporadically since it's introduction in 1969. For the next several years, Dinah Lance would play a much larger role than Black Canary. During this period, too, the character's storyline and attitude toughened considerably. February 1988-June 1993, Green Arrow #1-#75 — Dinah is the major supporting character in this series and though she has several forays into solo adventures (see below), she is largely the responsibility of Mike Grell who fails to develop her character too much beyond that of angry girlfriend with formidable right hook. August 1988, Green Arrow #7 — Canary dons a new non-costume and continues to occasionally fight crime though she all but abandons her secret identity at this point. 1988, Action Comics Weekly #609-#616 & #624-#634 — Black Canary gets her own forum, appearing in two insanely chopped-up stories in Action during its short-lived anthology period. She returns to her classic costume in the second story. November 1988, Secret Origins #32 — The post-Crisis tale of the founding of the original Justice League of America is officially retold, firmly establishing Black Canary's influential and meta-human beginnings in the new DCU. 1989, Green Arrow Annual #2 — The backup story, "Do Black Canaries Sing?" 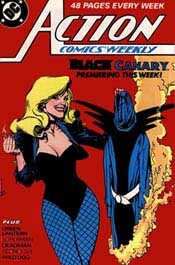 written by Sarah Byam, establishes Canary's loss of her sonic cry and reintroduces her mother, the original Black Canary, (albeit briefly) into post-Crisis continuity. Green Arrow #34, published a few months later, suggests she can no longer have children, also a result of the torture she suffered in The Longbow Hunters. August 1990, Secret Origins #50 — Both the Canaries get their basic origins spiffed up in this retelling. The clearest — and probably the first — explanation of the mother/daughter heroines' beginnings and, for Canary Sr., her ending. November 1991-February 1992, Black Canary: New Wings (miniseries) and 1993, Black Canary (monthly) — Dinah finally gets her own monthly series! Too bad it isn't a very good one. Writer Sarah Byam works out some issues via Dinah and the reader gets the short end of the stick. The art also fails to be appropriate to its subject. Dinah — a lithe and agile martial artist — is drawn far too lushly and with her hair always in her eyes so that it's impossible to believe she could manage to see her opponents let alone leap around as blithely as she does (before anyone jumps on me for this comment, watch Tonya Harding ice skate vs. Tara Lipinski or Michelle Kwan. The smaller one is, the easier it is to be airborne. Dinah's supposed to be kind of little, anyway. She was drawn wrong). A later artistic reinterpretation of the character (and again with a hideous new costume!) is simply better ignored altogether. According to Chuck Dixon, this series is not considered in continuity. June 1993, Green Arrow #75 — Dinah leaves Oliver, ending the romantic pairing of these characters which, though it had been occasionally de-emphasized, had endured for twenty-four years. May 1994-May 1995, The Ray #1-12 — In the wake of her series' cancellation and her breakup with Oliver and resultant departure from Green Arrow, Dinah is a character without a story. Enter Christopher Priest and his enjoyable monthly series, The Ray. Taking off from Ray's guest appearance in one of the only good stories in Black Canary's monthly series, Priest introduces Dinah as a major supporting player during this book's first year. She also makes several cameo appearances in other series as various writers honor her by keeping her in the readers' eyes. The most notable of these are a starring guest appearance in Batman: Shadow of the Bat #36 in March 1995 and a brief, delightful cameo in Green Lantern #63 in June 1995 which endeavors to explain how she ended up back in her classic costume again and reiterates the fact that her sonic cry is gone. October 1995, Green Arrow #101 — Dinah meets Connor Hawke for the first time in this watershed Green Arrow story in which she finds out about Oliver's death. Early 1996, Birds of Prey — Jordan Gorfinkle, Chuck Dixon, and Gary Frank reintroduce the Black Canary, remaking the character for the next millennium, finally getting her into a new costume that doesn't also make her look like someone's nightmare, and (brilliantly) pairing her with the perfect partner, Oracle. 1996, Kingdom Come — Alex Ross pays homage to the Dinah Lance and Oliver Queen by heavily featuring them (and their daughter, Olivia Queen aka Black Canary III) in his breathtaking artwork. 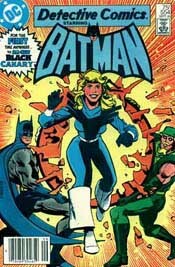 Though she has few lines, Dinah sides with Batman and acts, along with Oliver and Blue Beetle, as one of his prime co-conspirators and generals. November 1996, The Final Night & December 1996, Green Lantern #81 — Dinah reenters the mainstream DCU in full BoP gear, working once more alongside Batman and Superman as they fight to save the world. A major nod to the GL/GA glory days is given when she speaks at Hal Jordan's funeral. October 1998-January 1999, Arsenal #1-#4 — Devin Grayson redefines (or clearly defines for the first time) the character of Roy Harper, and Dinah plays an integral role in his story and his life. Another terrific character story which also serves to flesh out some Oliver Queen-related issues in the Canary's life. Another must-read for Canary fans. Grayson, obviously one of those fans herself, gives Dinah quite the star treatment in an extended cameo in her JLA/Titans miniseries published shortly afterwards. 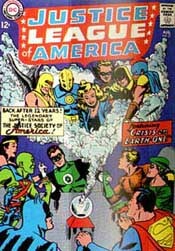 August 1999, JSA #1 — The Justice Society of America is reformed for the new millennium with Dinah as one of its founding members making Canary, once again as she was during the Silver Age, the only character to belong to both the JSA and JLA as the same person (rather than as a multiverse version of the same character or something of that sort)*. Bravo! It is interesting to note, as the series progresses, that Dinah is portrayed very much in the mode of the original Golden Age BC in this book — tough, unflappable, smart, clear-headed, and the go-to woman in any crisis. *=People have argued with me about this assertion, but what I'm saying is that during the actual time periods in question Dinah belonged to the JSA and the JLA. Until 1983 when it was "revealed" that the Bronze Age Black Canary was the daughter of the Golden & Silver Age Black Canary rather than the same person, there was only one Black Canary and she belonged to the JSA during the Golden & Silver Ages and to the JLA during the Bronze Age. 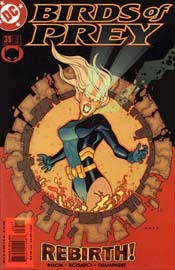 Post-Crisis, Black Canary II has belonged to a variety of JLA incarnations and helped found the current JSA. All of the "also rans" people have pointed out to me are of the revealed variety — we find out later that a character was the same character or actually belonged, too, but that is not the same thing as what I am saying. If there is another character who falls under the while-its-happening criteria, please let me know. November 2001, Birds of Prey #35 — In a 5-part story arc, the Black Canary regains not only her sonic Canary Cry power but is completely healed of all her past injuries (including her inability to have children) thanks to a dip in one of Ra's Al Ghul's Lazarus Pits. March 2002, JSA #32 and May 2002, Green Arrow #13 — Post-Lazarus Pit, Dinah hooks back up with the similarly resurrected Oliver Queen and then breaks right back up with him (at least for the moment). In the melee of these events, Dinah resigns from the JSA in order to reevaluate her life.